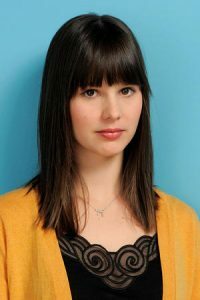 Rachel Korine is an American actress. She has appeared in films such as Septien, Spring Breakers, Mister Lonely, Trash Humpers and Men Go to Battle. From 2014–2015, Rachel was cast in Cinemax’s original medical drama The Knick as Junia, the series was directed by Steven Soderbergh. Born Rachel Anna Simon on April 4, 1986 in Nashville, Tennessee, she made her screen debut in the 2007 film Mister Lonely. In 2007, she married film director and screenwriter Harmony Korine. Together they have one daughter, Lefty Bell Korine. *She was born in Nashville, Tennessee on April 4, 1986. *She made her acting debut with the 2007 film Mister Lonely. *She married film director and screenwriter Harmony Korine in 2007.